MARION, Ark. (March 26, 2019) – Derek Hagar isn’t afraid to shake it up, which is exactly what he’s doing this weekend. Hagar is taking the wings off his sprint car as he heads to Florida for a Southeastern Sprint Car Series doubleheader on Friday and Saturday at Southern Raceway in Milton. It will mark his debut at the track. 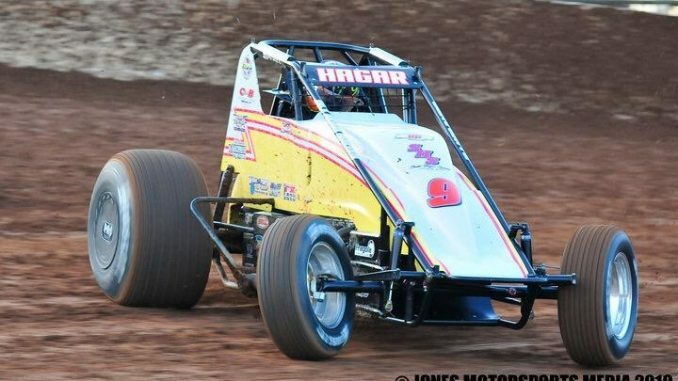 Hagar last ran his sprint car in a non-wing event in September 2013 when he recorded back-to-back top 10s at his home tracks of I-30 Speedway in Little Rock, Ark., and at Riverside International Speedway in West Memphis, Ark. Hagar most recently raced a non-wing sprint car in September 2016 when he recorded a pair of top fives during the Jesse Hockett/Daniel McMillin Memorial. He was also victorious in a non-wing sprint car race earlier that year. “Hopefully we can put together a couple of good nights in Florida this weekend and come away with a win or two,” he said. Since 2002, B&D Towing and Recovery, which is located in Marion, Ark., has been the exclusive source for professional towing, recovery and transport by major Memphis truck dealerships, parcel delivery companies, nationwide trucking firms and more. For more information, visit http://www.BnDTowing.com. Hagar would also like to thank Dynotech Performance, DHR Suspension, J&J Auto Racing, Fragola Performance Systems, Xtreme Race Graphics, Southern Collision Centre, ButlerBuilt Professional Seat Systems, Weld Wheels, Hinchman Racewear, Wix Filters, Wings Unlimited, FK Rod Ends, Valvoline and Ti64 for their continued support.